Broad Haven is always overcrowded with tourists in the summer and on bank holidays - the beach can take the tourists but the car parks can't, so people tend to park illegally on the double-yellow lines and thus cause chaos along the sea front. Speaking of car parks - the first one you come across (from Haverfordwest) is signposted as the main beach car park. This is a large pay & display park close to the N end of the beach. Whilst ok, the closest you can get to the beach is about 400m, and if the car park's getting full, add another 200m to that. In other words it's a bit of a trek with all your gear. 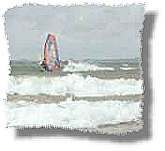 Most windsurfers tend to drive along the sea front to the S end of the beach where there's another small car park about 30m from the beach. Consequently this gets very popular. Please don't fill this car park up when I'm there ;-) . This car park is Pay & Display - £2 for all day in 2011. Broad Haven is a Good Beach Guide featured beach (Blue Flag in 2011) and, like Newgale, is a bit of a trek to the water at low spring tides. That said, if there's any S in the wind, it gets progressively cleaner as the tide goes out and out of the wind shadow of the headland. There can be some great waves here - I've regularly seen people pulling off back loops & other things I'm too old & sensible to try :-( . Broad Haven was formerly the home of the annual Sunshine Challenge - a surfing / windsurfing event run for charity and organised by of Haven Sports - located just opposite the "convenient" car park. Here the emphasis is on fun & laid-back competition. 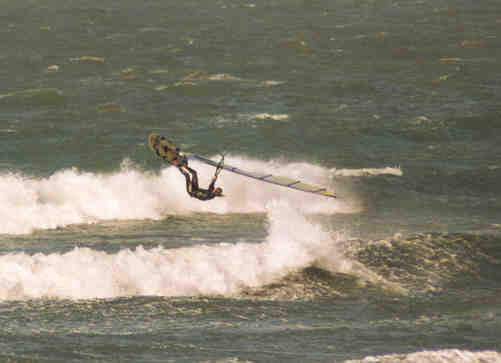 For the last 3 years (97-99) however, this event has been a signal for the wind gods to turn their attentions elsewhere, turning the marathon (Broad Haven to Newgale) into a long board trial. 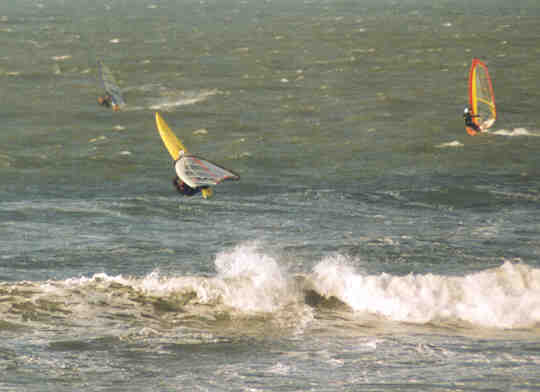 In '97, the wind died completely on the return leg & we ended up being carried backwards slowly in the current! The safety boats came to the rescue and, although I couldn't see it from shore since I was part of it, the sight of 4 windsurfers in line astern formation following a RIB and apparently planing in zero wind must have been somewhat perplexing. Until, of course, you noticed that we were all being towed! Alas, the Sunshine Challenge is no more. Haven Sports rent out surf & body boards & wetsuits for those windless days (usually coinciding with my visits there) & always have a good selection of used boards & sails - I personally know of at least 3 boards Ian Heys - the proprietor - has taken off myself or colleagues in part-ex. Ian is always good at letting you try gear out too. Be aware that there are actually 2 Broad Havens within about 10 miles of each other (where else could this happen?). 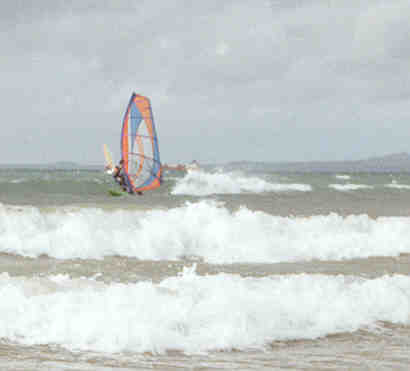 The one of interest is on St Bride's Bay (OS Ref: 860135), the other one is by Bosherston, S of Pembroke (OS Ref: 978940). To get to the right one (for our purposes) - From Haverfordwest, take the B4341 & keep going until you drop into Broad Haven. The beach faces WNW and has a big headland at the S end separating Broad Haven from Little Haven (walkable over the beach on spring lows). Unfortunately, this headland does cause a fair old wind shadow with corresponding flukiness in S & SW winds. Although it's a long walk, the beach is best at low tide in S & SW winds because you're clear of the headland then. HW springs tend to occur around 07:00 - 08:00 (19:00 - 20:00). HW neaps around 13:30 (GMT). No real problems with tides or currents. You can't sail here on spring highs as there'll be no beach left. On spring lows, you'll have a 300-400m trek to the water, but it's firm sand all the way. The waves tend to flatten out as the tide comes in. Spring highs come up to the small shingle bank - don't think of sailing at this state of tide. Also like Newgale, it's sand all the way - just a couple of small rocks towards the N end of the beach & then a bit of a rockpile at the N extreme. Ie: Don't sail there. I've not noticed any rips but I have noticed a slight northbound current from time to time as the tide comes in. Slight southbound current on a falling tide. Car park close to beach - pay and display. £2 for the day (2011). Toilets in the car park opposite Haven Sports. 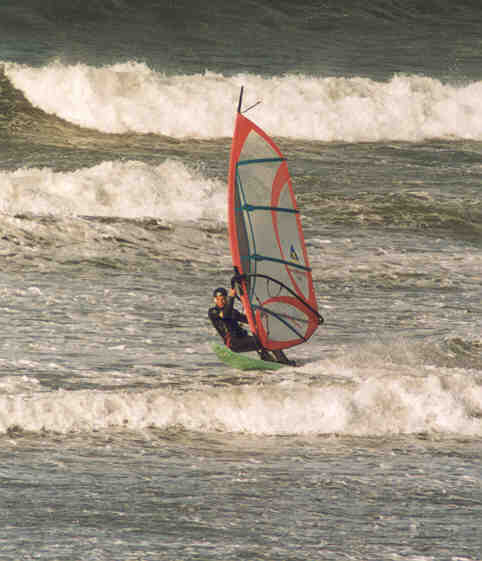 Ian Heys, Haven Sports can do sail repairs & can organise board repairs. There's a good Londis shop on Broad Haven's sea front - useful if you're self-catering. They also do rolls, hot pies & pasties. The beach cafe does fish & chips, as does the more recently-opened cafe opposite Haven Sports. The Anchor Guest House in Broad Haven used to be really good. However, I believe it's changed hands a couple of times since I was last there (2002) and I've had no reports since then. We are a 4 star guesthouse in Pembrokeshire very close to Newgale, plenty of storage space available for equipment, we are happy to offer your members a generous discount off our normal tariffs. See our web site or call us for further details. Sounds to me like an offer worth pursuing. Broad Haven has a 3 star rated Youth Hostel. The Ocean cafe (formerly the Nautilus cafe) does coffee & cakes. It also has a bar & restaurant. The beach cafe next to Haven Sports is pretty good. Eat in or take out. The Galleon on the sea front is now a Brain's pub. It's always busy & they do good food. There's also the Royal (amazing a small place like this can support 2 pubs, especially out of season), another Brain's pub - which is tucked away behind the sea front. Follow the road past Haven Sports, keep bearing left & it's there on the right - big blue place about 300m from the front. Often quieter, and definitely more convivial than the Galleon, they play host to the local Whist club who take over the bar & consume vast quantities of tea on Tuesday(?) nights out of season. They also do meals & have a couple of real ales on. In Little Haven, the Castle & the St Bride's both sell real ales. I believe all of them offer the dreaded Worthington's Draught but may - if you're lucky - offer an alternative. The Castle is reasonably OK but gets busy at mealtimes and they do not take table bookings. Nautilus is good but expensive - booking essential. Best pubs are the Griffin in Dale, Georges and Pembrokeshire Yeoman in Haverfordwest and all the pubs in Solva!! I visited the Galleon over the past few weeks following a friends recommendation, as the pub had recently changed hands. It has been given a pleasant facelift and the new managers seem to have revitalised the place (reading from previous comments). The food was great, and the service was likewise - a pleasurable evening was had by me and the family, and I would highly recommend a visit if you're in the area. The YHA does reasonable food in the evenings and great breakfasts if you're staying there. Content supplied by . Updates from Gary Pitchford - Aug 2004, Wayne Thomas - Sept 2005. Anon contributor, Aug 2006; Dean Francis - Sept 2006. Many thanks to all. Note: All comments and opinions mentioned in this section of the site are the personal opinions of the various contributors. Inevitably, one person's favourite may be another person's least favourite. The information provided here is provided in good faith. We can take no responsibility for the consequences of any inaccuracies. Should you find any inaccuracies, then please take the trouble to tell us, using any of the update links.